Who’s afraid of Errol Spence Jr.? NEWLY minted world boxing sensation Errol Spence Jr. bared Floyd Mayweather Jr. had told him he doesn”t have any ambition of coming back. So who could loom large as Pacquiao’s next foe than Errol Spence, who rose to full pound-for-pound stardom with his masterful conquest of four-division world champion Mikey Garcia in Arlington, Texas last Sunday? Actually, several pundits, after watching how the 29-year-old Spence annihilated Garcia, expressed apprehension, saying the 40-year-old Pacquiao could be easily thrashed by Spence. Bob Arum himself said he fears for Pacquiao, as Spence is too big and powerful a foe for the fighting senator. There were also those who said they feared Pacquiao could be in for a shredding. Spence was however quick to explain he could not take Pacquiao lightly, as the lone eight-division boxing champion has remained a profusely dangerous foe. “It’s going to be a competitive because Pacquiao has the heart, he is a warrior, not scared of anyone,” Spence told a Fox Sports morning show. Anyway, a poll conducted by boxing page EditinKing among over 5,000 fans showed Pacquiao only a second choice, behind unbeaten WBO welterweight champion Terence Crawford, who was picked by 47% of the respondents. Pacquiao, the WBA regular welterweight title- holder got 28%, followed by Keith Thurman with 15%. Doing a Spence-Crawford would however be next to impossible, because the two boxing stars belong to fiercely opposed promotional outfits. Pacquiao is now aligned with Premier Boxing Champions, while Crawford is with Top Rank. Pacquiao has responded positively to a dare by Spence, who hailed the Filipino superhero on top of the ring after the championship fight in Texas on Sunday. Spence also fights for Haymon and there’s a popular feel Pacquiao against Spence would be arranged smoothly by the influential PBC top man. 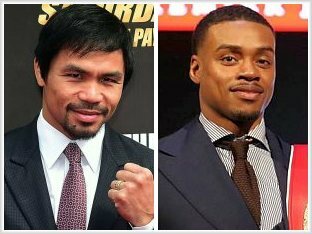 Many other experts may not be aware of it, but Pacquiao is the least worried about Spence’s newfound worth. In fact, Pacquiao confided to a trusted Filipino sportswriter before leaving Arlington for Los Angeles that he did not find Spence a truly big puncher. Pacquiao went as far as compare Spence to petty-punching South African Lehlo Ledwabah whom the fighting senator mangled in his US debut in 2001. Shouldn’t it be Spence who should be worried instead?